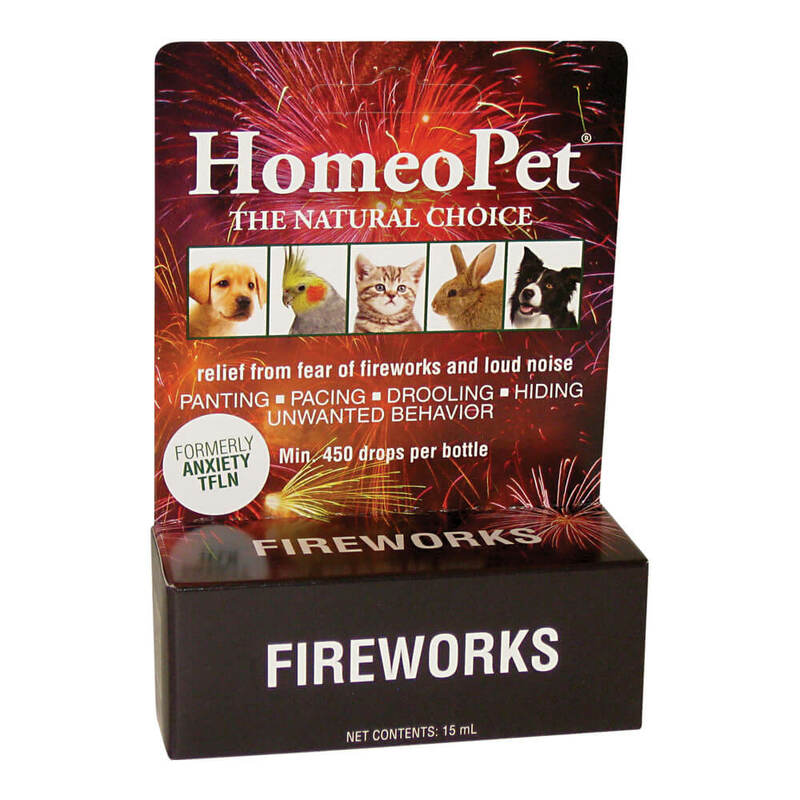 HomeoPet® Anxiety TFLN helps your pets with specific phobias from fireworks, thunder, lightening, loud noises, bird scarers, gunfire, backfiring from vehicles, general sensitivity to any sudden noise, or in some cases where there is sensitivity to anything sudden. Starting from external impressions. Fear of storms, electromagnetic storms or fields. Fear after electrical shocks, sensitivity to winds or drafts. Fear of explosions such as mining, shell explosions, quarrying, fog warnings and seismic testing. HomeoPet® Anxiety TFLN is 100% natural, with no chemicals added. Made in the USA. Administration: Optimally, the liquid preparation should be dropped directly into the mucous membrane of the mouth including lips; ideally in dogs by pulling out the labial pouch, and in cats by raising the head until the mouth opens. Where an animal finds this distressful, or an owner is unable to comply, the medication can be put in the food, water or milk. Where animals are sensitive to the odor of the alcohol preservative, a 10-20 minute period should be allowed for dilution and evaporation before the liquid or food is presented to the patient. Occasionally, animals will shake their heads as a response to the alcohol preservative; cats may salivate excessively and in these cases, presenting it in food, water or milk works. It can also be added to a sprayer and misted in the air around severely affected patients to calm them down. Ingredients: Phosphorus 6c&30c, Rhododendron 6c&30c, Borax 6c&30c, Theridion 6c&30c, Chamomilla 6c&30c in 20% USP alc. in purified water.